I was approached by Score Golf Magazine in the fall of 2016 to provide three instructional articles for the 2017 golf season. This one was all about building the confidence needed to swing your driver with freedom. It was a great experience and I love how the articles and imagery worked out. Trust between you and your driver is crucial to hitting good tee shots. TO HIT GREAT TEE SHOTS, YOU NEED TO SWING FREELY, IN BALANCE AND WITH A LOTof trust and commitment to the shot. That’s easier said than done, given the driver is the hardest club in our bags to hit. But it’s important to guard against doubt creeping into your driver swing. When that happens you’ll try to control your miss, which can be deadly. Generally in golf, when we try not to do something, rather than try to do something, our misses get larger. To hit your driver better you need to build trust with it and swing more freely. Here’s how. When practising tee shots on the driving range, alternate between your favourite short iron and your driver. Hit one then the other and so on. 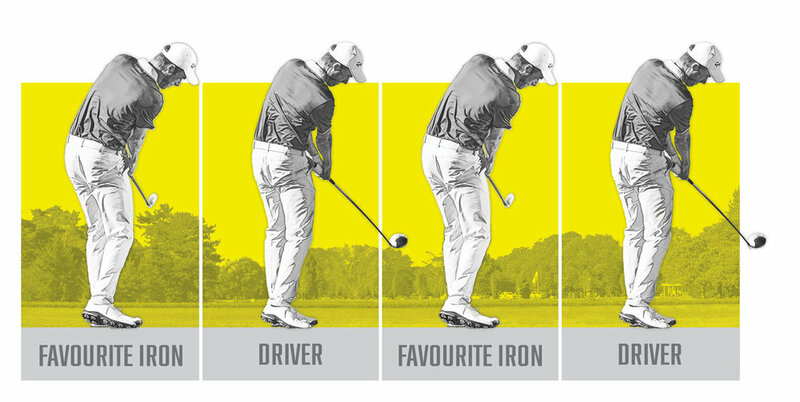 The solid contact and comfortable rhythm that is easier to find with a short iron will start to translate into the larger, more aggressive swing required for a driver. Do this drill during every practice and warm up session and you’ll provide yourself the freedom needed to let those tee shots go.